A beautiful rocking chair must satisfy different needs. Are you looking for back pain relief, styling, perfect fit, great craftsmanship, or a combination of these? Rest assured, you are in the right place. My website is dedicated to giving you information about all aspects of the custom rocker. I’ll give you the inside scoop, gathered from years of experience designing and building these fabulous pieces. The Multiple Award-winning Bonn Zero-G Rocking Chair ! As you scan through this site, my hope is that by picking my brain for answers, YOUR mind is put at ease. Here is a video by the good folks at Bluegrass and Backroads about these rockers. Gain confidence in understanding what to look for. Learn what “custom fit” really means and how to achieve it. Understand the differences between a good vs. great rocker. Discover how the design and building process work together to bring you the ultimate in comfort and style. Gather many other useful “nuggets of knowledge”. There are several reasons why a really great hand made rocker is quite challenging to build. First, a rigid material (wood) needs to be sculpted, shaped and joined to fit a soft material (YOU). Furthermore, it has to accommodate not just any human body, but that of a unique individual (also YOU). I have an entire section devoted to this all important fitting process. Secondly, the chair must be made to carry a person’s weight while tilting back and forth a countless number of times. This motion causes a high degree of stress on its joints (while at the same time relieving stress on yours!) Unfortunately, the vast majority of rockers are stationary chairs with runners applied to their legs. They are simply not designed for rocking forces. Third, it should be inviting to the touch and attractive to behold. If not, it wouldn't serve its intended purpose of providing relaxation for both mind and body. Finally, the right kind of finish is critical for meeting the demands of the location where the rocking chair is used. They are found in offices, dens, family rooms, nurseries, porches, and backwoods cabins, just to name a few. The finish must deliver both beauty and durability. Combining all this into a beautiful package is quite a feat. You can see the level of thought and preparation that must go into each chair! The net result, if done right, is a beautiful rocking chair (like my "Zero-G" series) that hits a "sweet spot" of serenity in your busy life. The rocking chair is great for relaxing the mind and body. Here's why. The rocking chair is remarkably good at relaxing your mind and body. Here are some of its many benefits waiting for YOU. What are the best rocking chairs, and how do you know when you've found one? Great question! Here's some important qualities to look for. The custom rocking chairs fitting process requires part science, part artistry and a lot of good old-fashioned experience. Here's how I get a great fit every time. Do Wooden Rocking Chairs Require Special Materials? Custom wooden rocking chairs require careful selection of the best materials for their construction. Here's why. 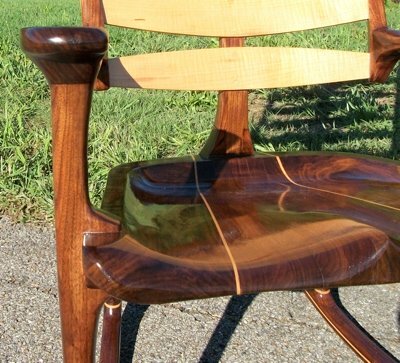 A Custom Handmade Rocking Chair is a Marvel of Construction. 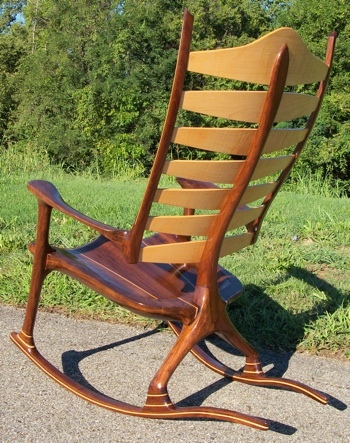 A custom handmade rocking chair is a marvelous mixture of engineering, art and construction. Here are how the best are made. Modern Rocking Chairs Require the Best Finishing Process for Lasting Beauty. Modern rocking chairs remain beautiful for decades because of the finishing process used to protect them. Great care and knowledge bring out the best in your chairs' wood. Here's how. My rocking chairs give you the most comfort and beauty available today. These handmade rocking chairs have unique styling, incredible comfort, and offer a welcome retreat from the stresses of today, tomorrow, and decades to come. Making the Handmade Rocking Chair is My Joy and Passion in Life. Creating your handmade rocking chair allows me to share the great blessings I've been given. The gift comes from God, then passes through my hands and into your heart. Wooden Rocking Chairs Reach the Peak of Perfection When Custom Made to Order. Wooden rocking chairs are most cherished when they are handmade just for you. Contact me, and I'll take you through the ordering process. People say my custom rocking chairs are so much more impressive to actually see and use in person. Here's where they will be available for you to try out. The custom rocking chair is not all that I make. Check these out! The custom rocking chair may be the pinnacle achievement of my furniture making, but here are other equally beautiful pieces built for clients.